In the only Taylors Garages Premier Division game of the weekend Boston College went down 6-2 at Pointon. Ian Jacquest (two), Nathan Wilson (two), Dom Kew and Ben Dobson hit the crucial goals for Pointon. The College replied through Kieran Rodgers and Nathan Rivett in a week where 10 of the 18 scheduled league matches fell foul of the weather. With Railway’ game at Donington postponed, Fulbeck United moved to the top of the Taylors Peugeot Division One table following a 2-0 away win at Fosdyke. Jason Barratt and Dylan Grocock grabbed the goals to keep United on track for promotion. With Graves Park struggling with the heavy conditions, Kirton Town’s home match was switched to Woodhall Spa United’s ground. The switch did Town no favours as Woodhall swept Kirton aside after they trounced their opponents 5-1. Tom Richardson (two), Nathan Wright, Callum Cheetham and Tom Avison were all on target for Woodhall. AFC Tetford have declared that they can no longer carry on and their withdrawal application will be considered at next month’s Management Committee meeting. Coningsby Reserves’ strong side proved too much for Spilsby Town Reserves in the Taylors Ford Division Two. Goals from Carl Wilson, Sean Taylor and Mitch Griffiths secured a comfortable 3-0 home win. In the other game, Pointon Reserves moved into second spot following a 4-0 away win at Swineshead A.
Mareham United were close to securing victory in their home match against Benington Reserves when they held a 2-0 lead going into the final 20 minutes of their Taylors Vauxhall Division Three clash, thanks to Daniel Burns’ double strike. But their hard work was undone by Benington as they salvaged a point with two late goals from Jamie Lawson and Colin Cheer. There were no doubts concerning Northgate Olympic’s home match when their 3G pitch proved its worth. The Sleaford-based side brushed aside Spalding Harriers 4-0. Goals from Daniel Broughton, Ryan Smith, Gareth Tomlinson and Rob Spencer did the damage for Northgate. 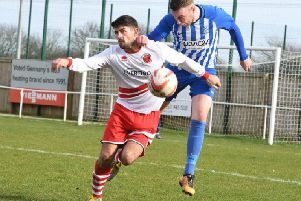 The final of the Fishtoft Cup will feature a clash between the top two sides in the Premier Division after Spilsby Town eased past Benington, while Swineshead just scraped through against a fearless Friskney side. Benington competed well enough in their home tie against Spilsby before the opening two goals clearly deflated the home side. Liam Papworth, Travis Herberts, Jordan Smith and Jordan Turner were on target for Spilsby. In the other semi-final, Division One Friskney put up a tremendous fight against Premier table-toppers Swineshead. The plucky underdogs forced their opponents into extra-time before a late winner put an end to Friskney’s brave display. Swineshead went 1-0 up after 10 minutes before Greg Brown levelled the scores. Again Swineshead sneaked ahead at 2-1 only for Victor Sibert to bring it all-square once more at 2-2, and the striker went desperately close to putting the underdogs ahead when he burst through on a one-on-one with the keeper, but he rolled his shot the wrong side of the post. In the second half, Swineshead went 3-2 up early in second half from corner before Jed Stainton made it 3-3, also from a corner. For the first time in the match Friskney forged ahead 11 minutes from time when Greg Brown scored to make the score 4-3, and a real shock looked on the cards. Swineshead’s first heart-breaker came five minutes from time when they equalised at 4-4 following a corner with just five minutes remaining. The Premier side then dealt an even more devastating blow in extra time when they snatched a winner to make the final score 5-4 following a free-kick.